Doing laundry is never fun, but it’s considerably better when you have your own washer and dryer. Adding heavy lifting downstairs (or down the block) to communal machines that just held who-knows-what adds a whole other layer to this chore. If you’re in the market for a washer, one of the first choices you should make is between front-loaders and top-loaders. These machines treat your clothes very differently and there are lots of factors — from price to laundry room layout — that may sway you in one direction or the other. Which is for you? We’re here to help you suss out the pros and cons of front-load and top-load washing machines. It’s been said falling in love is hard on the knees, and the same could be said of front-loaders. Even with a pedestal, they require some bending, and no matter what, we always end up dropping a sock or four when transferring to the dryer. However, some (but not all) are stackable, making them more apartment-friendly. One thing to keep in mind is which way the door swings open: You don’t want your access to the interior obstructed by a door that can’t open all the way. (Electrolux models have reversible doors.) Similarly, if you have a low shelf or want to put your machines under a counter, a top-loader’s lid will be a problem. They do require less bending, but shorties have been known to have trouble reaching the last few items at the bottom of cavernous top-loaders. The placement of the control panel can also cause problems. Having them on the front of a top-loader might mean some pressed buttons as you lean in to grab your items. Some front-loaders have pause buttons so you can throw in forgotten items mid-cycle, but others don’t. Samsung has their handy door that lets you pop in a stray sock, too. Most machines won’t let you do anything of the kind. There are two types of top-loaders: Those with agitators and high-efficiency models without, though some of these have impellers. The standard agitator models are the type you likely grew up with: The tubs have a post in the middle. This is the agitator. Ready for further confusion? There are two types of agitators: Single-action and dual-action. The single-action variety usually has large fins or paddles on the bottom and smaller ones at the top. These spin and help circulate the laundry around the tub. Dual-action agitators also have bottom fins that work like the single-action’s, but the top is spiraled. The top spins independently to push clothes toward the bottom of the washer. High-efficiency top-loaders may have no agitator, and might have a smaller impeller. Impellers are a bit like shorter agitators. They take up less space but also spin, creating currents to churn clothes around the drum. These impellers might be cone-shaped or have fins as well. High-efficiency top-loaders with impellers might also have a drum that acts a bit more like a front-loader, spinning faster than those with agitators. The problem with agitators is that they use mechanical action to clean clothes, which can be tough on fabrics. Impellers tend to be a bit gentler but items like towels can still get tangled up, depending on their design. Front-loading machines don’t have agitators at all, though the back of the drum may be molded to low-profile, flattened cone. Around the drum, you’ll typically find vanes that help tumble the laundry around. Usually the tub spins both ways, and as soiled items bang around, some of the dirt is knocked loose. The lack of an agitator means front-loaders treat clothes the gentlest, though using high heat and deep-clean options will obviously do more damage than a delicate cycle. Cycle times vary greatly by machine for both types and will depend on load size, soil level, and other features you can customize. One GE top-loader has a normal cycle that lasts a little over half an hour, while one of Whirlpool’s is over an hour. Normal cycles for front loaders can vary between half an hour to closer to 50 minutes. 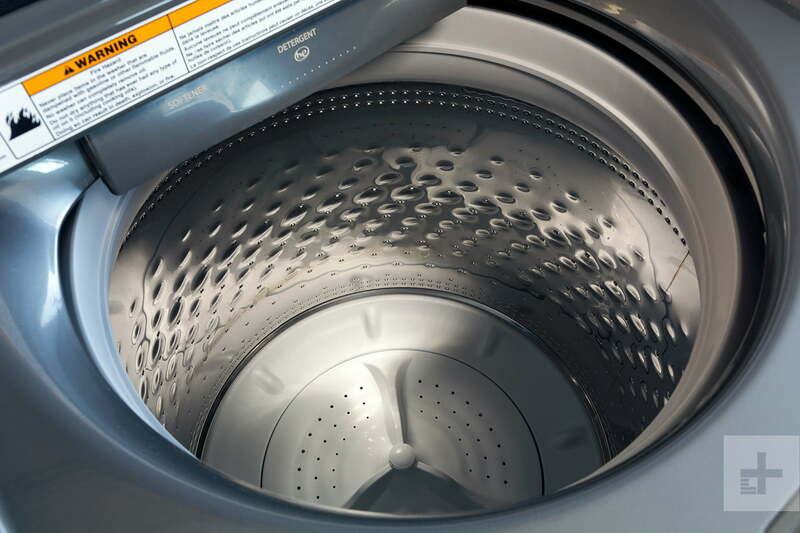 “Top load washers generally require a lot more water and energy to complete a cycle versus front load because they fill the tub and float clothes in a detergent filled solution, versus moving the clothes through that solution in front loads,” said Eloise Hale, vice president of communications and public relations at Electrolux. When front-loaders first started appearing on the U.S. market, people were weirded out by the amount of water they used — or didn’t use, we should say. Standard top-loaders with agitators would fill up the tub to help clothes float, so they could move around better and take advantage of the the pole’s mechanical action. But front-loaders and high-efficiency top-loaders use far less water, because the drum is moving them around, lifting them up, so they land in a shallower pool of water. How much less water? Samsung said its front-loaders use 13 gallons of water per cycle, while its top-loaders use between 18 and 23. If you look for an Energy Star label, you’ll know the machine is using at most 13 gallons per load, but the agency also employs a water-factor number, because you need to take a machine’s capacity into account as well. A cycle might use only a few gallons of water but be less efficient than one that uses more water to clean more clothes. The WF is the gallons of water a washer uses per cycle per cubic foot; the lower the WF, the better. To get an idea of the difference in water usage between top-loaders and front-loaders, all you have to do is look at the Energy Star requirements. Front-loaders consistently out-perform top-loaders in cleaning tests. Indeed, those in the market for washers are so tied to their love of H2O-guzzling machines that GE added an optional “deep fill” button to some top-loaders, letting worried laundry-doers add more water to their cycles. Whether or not this actually gets clothes cleaner isn’t really clear, as front-loaders consistently out-perform top-loaders in cleaning tests. One thing to keep in mind is that high-efficiency does not equal Energy Star. A machine can use less water and require high-efficiency detergent, while still not meeting the money-saving program’s standards. If you sort Energy Star’s list of certified washers by annual energy use, you’ll see there are more front-load washers than there are top-loads. They simply can’t compete with the efficiency of many front-loaders. 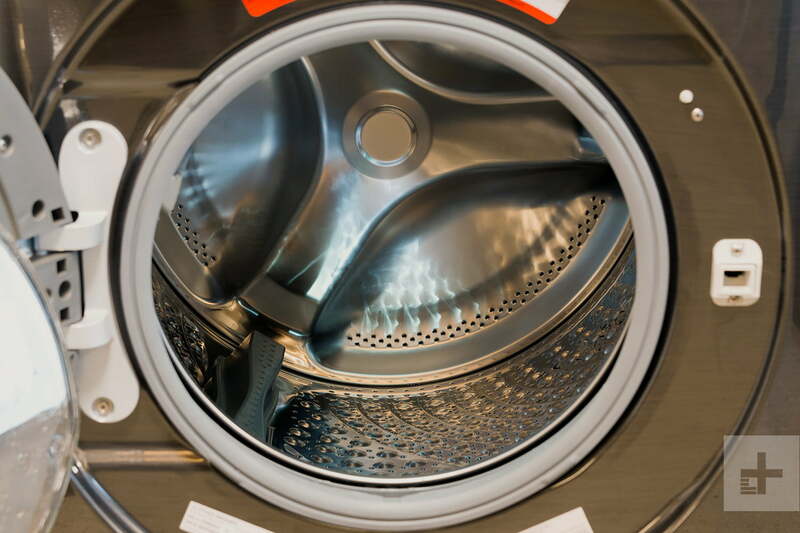 The program’s list of most-efficient washers doesn’t include any top-load models (unless you want to include the mini washer in the Samsung Flexwash). That’s not to say top-loaders can’t be efficient. The tables below show that the amount of kWh per year varies widely among the machines, and the top-load Samsung WA50M7450AW does have the front-load GE GFW450SPKDG beat in terms of efficiency. Keep in mind that this is just the energy the machine itself is using. Using less water or cold water will further reduce energy costs. You might look at the tables and wonder why we listed the machines’ maximum spin speed. This will actually affect the efficiency of your dryer, because a faster spin wrings out more water, leaving less work for the other laundry machine to do. Again, front-loaders have the edge here. Top Loaders Capacity Energy Use MSRP Agitator? Max Spin Speed? Front Loaders Capacity Energy Use MSRP Max Spin Speed? If you look at the tables, you’ll see the capacities are a bit similar, with the top-loaders ranging from 4.1 to 5.2 cubic feet and the front-loaders landing between 4.2 and 4.9 cubic feet. However, Samsung makes a ginormous 6.0-cubic-foot front-loader, and Kenmore’s 6.2-cubic-foot top-loader even has that beat. As long as your washer has 4.5 cubic feet of space, you should be able to fit king-size comforter in there, or between 15 and 20 pounds of laundry. Regardless of size, an agitator may affect how you distribute clothes or towels in the tub and will reduce capacity somewhat. One issue that cropped up in the early days of front-load machines was mold. One issue that cropped up in the early days of front-load machines was mold. The door closes tightly (to prevent leaks, obviously), and that meant the inside of machines could get funky — and not in a good way. Many manufacturers started including self-cleaning cycles in response, and many owners leave the door open in between washes to help water evaporate. There are ways to clean washers to keep the problem at bay, too. Originally, front-loaders were much more expensive than top-loaders, but they’ve come down in price over the past few years. They do tend to skew closer to $1,000 than to $500, but you can find front-loaders with over 4 cubic inches of capacity and some great features for between $600 and $700. High-efficiency top-loaders tend to be more expensive than old-school agitator models and can cost more than some front-loaders, depending on capacity and extras. However, excluding major sales, it’s hard to find a good front-loader for under $600. Top-loaders look mighty tempting when you can find them on sale for under $400. If you still want a top-loader, you’re not alone. Some manufacturers are more outspoken about it than others, but the consensus from several we’ve spoken to is that front-loaders win in cleaning power and efficiency, especially when it comes to water use. The Energy Star program’s findings bear this out as well. The American Cleaning Institute (ACI) has found that most people unhappy with their front-loaders’ performance are actually misusing HE laundry detergent. When it comes to front-loaders, there can be some new quirks if you’ve used top-loaders your whole life, including learning to dial back the detergent. But if front-loaders fit your appliance-buying budget, they definitely have some major advantages over their water-loving counterparts.